Summary: Difference Between Dementia and Alzheimer’s is that Dementia is an umbrella term including the group of symptoms occurring together but is not a disease that negatively impacts memory of an individual. Dementia is caused by the damage to the brain. Whereas Alzheimer is a disease which causes damaged and death of brain cells by disconnecting nerve cells, forming plaques, clumps and losing communication between neurons. Alzheimer leads to Dementia by destroying brain cells this means that anyone with Alzheimer will ultimately develop the symptoms of dementia. Alzheimer is an irreversible neurological disorder characterized by the death of brain cells eventually leading to memory loss and cognitive skills (thinking, learning, remembering abilities) of a brain are progressively destroyed. This disease leads to the formation of amyloid plaques (amyloid protein divides improperly forming a sticky beta-amyloid) and neurofibrillary tangles (primary markers of Alzheimer disease and are insoluble hyperphosphorylated tau protein) thereby disconnecting the neurons ultimately leading to their death. These symptoms are mild at the start of disease but progressively become acute as time passes. Early stages include forgetfulness of recent activities and troubled thinking. At middle stages of this disease confusions and obsessions increase and delusion (believing on outrageous things) hallucinations (false illusions) mood swings and insomnia also occur. Later and acute stages include Aphasia(inability to understand language) Dysphagia (difficulty in swallowing), uncontrolled excretory reflexes and Amnesia (loss of short and long term memory due to brain damage) are reported. Medical history people having diseases like Down syndrome or MCI(mild cognitive impairment) have higher risks of developing Alzheimer’s disease. IS ALZHEIMER A GENETIC DISORDER? Risk genes (that increase the probability of disease occurrence but not particularly disease causing)like APOE-e4. Apo-lipoprotein E genes occur in three different forms in humans which are 2, 3 and 4. These genes may occur in combinations and people having (4, 4) combination are likely to develop the disease but people with (2,2) combination show resistance against developing disease. People having one copy and having two copies inherited from parents have three times and eight times more chances to develop the disease at a younger age. Deterministic genes (everyone having this gene will surely develop the disease) all these genes directly affect the production of beta amyloid protein. Familial Alzheimer’s disease is inherited form and if a parent has a faulty gene for FAD then it increases the chances of off-springs to develop the disease by 50%. The faulty genes are Presenilin 1 and 2 & amyloid precursor gene. Mutations in genes on chromosome 1,14 and 21 are also associated with the development of Alzheimer. Diets high in trans fats (snacks, bakery products and fried items) and saturated fats (red meat, dairy items and coconut oils) should be avoided as they produce large number of free radicals thereby killing brain cells. Food having antioxidant ( thiols/ascorbic acid that terminate free radicals producing reactions that are potentially harmful for cells ) properties are very effective against Alzheimer’s disease. Take folic acid (vitamin B9) as it reduces homocysteine levels that is the major cause of cardiovascular diseases and memory loss. Vitamin B9 containing foods are green leafy vegetable, citrus fruits, lentils, beans etc. Vitamin C (ascorbic acid) when taken along vitamin E(tocopherols/tocotrienols) 20% reduces the chances of disease. Vitamin C containing foods are strawberries, oranges, grape fruit, guava etc. vitamin E containing items are plant oils, spinach, almonds etc. 4 micrograms of vitamin B12 ( Cobalamin) should be taken as it checks aging process. Berries include Anthocyanosides reducing free radicals and amyloid plaques and therefore active against fighting disease. High iron levels also contribute to disease development. Iron initiates free radical reactions. Iron build ups in brain as aging occurs. The primary cause of iron accumulation is myelin. Myelin requires a lot of iron for its functioning but myelin stops growing as person crosses 50 in this way the iron required by myelin starts accumulating in different brain regions. On one hand copper plays important roles in our body like nerve communication, hormones secretions etc. but on the other hand high levels of copper are one of the major causes of Alzheimer’s disease as high level of copper damages the system by which beta amyloid plaques are removed from the brain. Adopt active and healthy lifestyle. Exercise for at least thirty minutes a day. According to Alzheimer’s association there is no proper cure for Alzheimer’s disease. Moreover the progression towards disease cannot be delayed or stopped yet. Numerous researches and investigations has been done in this regard. Dementia is also known as Senility. Dementia is not a specific disease rather it is the combination of symptoms that affects brain’s cognitive abilities like thinking, remembering, language impairments, Ability to focus, visual perception and communicating i.e neurocognitive disorder. One of the symptom is paranoia (loss of touch with reality). It includes all those symptoms when brain cells stop working properly. Most important symptom is memory loss but not all memory loss is indicative of dementia. Symptoms are worsen gradually with the passage of time. Dementia includes combination of symptoms like memory loss with other impairments. It occurs due to physical changes in brain. It is the indicative of several other underlying brain diseases. The chances of having dementia increases with increasing age but it’s not the part of normal aging process. About 47.5 million people around the world are living with dementia. The most common cause of dementia is Alzheimer’s disease but not all the dementia are due to Alzheimer’s disease. Alzheimer accounts for 60-80% of dementia. Brain strokes due to injuriesor concussions (traumatic brain injury to soft tissues of brain). Down’s syndrome (Disorder marked by physical abnormalities due to trisomy of chromosome number 21). Huntington’s disease (hereditary incurable brain disorder causing mental and physical deterioration). Infections of CNV (central nervous system) like Meningitis (severe inflammation of meninges causing headache, fever and muscular rigidity) Creutzfeldt-Jakob disease (neurodegenerative disease causing mental, physical and sensory illness) and HIV (human immune deficiency virus). Fluid accumulation in brain regions. Depending on cause some dementia can be reversed. CORTICAL DEMENTIA: In this type the part of brain known as cerebral cortex is affected which is responsible for memory and language. Alzheimer’s disease and Creutzfeldt-Jakob disease are two types of cortical dementia. SUB CORTICAL DEMENTIA: In this type sub cortical regions of brain are affected. People having sub cortical dementias have tend to have reduced thinking ability and speed. Parkinson’s disease (nervous system disorder characterized by the problems with movement of body due to deficiency of dopamine or degeneration of basal ganglia), Huntington’s disease are the cause of sub cortical dementias. VASCULAR DEMENTIA: It accounts for less than less than 10% of dementia. In vascular dementia the blood vessels are blocked or ruptured so that it might cause bleeding in the brain region or strokes due to which it was previously known as post-stroke dementia. It leads to inability of person to take decisions. FRONTO TEMPORAL DEMENTIA: In this type of dementia the frontal and temporal parts of brain are damaged. These parts are involved in behavioral control, speech etc. DEMENTIA WITH LEWY BODIES (DLB): This type of dementia has symptoms that are linter linked with both Alzheimer’s disease and Parkinson’s disease. It is second most common type of dementia after Alzheimer’s disease. It occurs because of clumping of alpha-synuclein proteins in nerve cells. Its symptoms include lack of coordination of bodily movements, depression etc. WERNICKE-KORSAKOFF SYNDROME: It is common in people with high alcohol consumption. It occurs because of vitamin B1 (thiamine) deficiency it can cause vision changes, Ataxia and badly affects memory. MIXED DEMENTIA: such patients have mixed symptoms of Alzheimer’s disease and vascular dementia. Majority of dementia are not inherited but we may inherit the genes that may increase our chances of developing any type of dementia as in case of vascular dementia the chances of diseases development increases many folds if a person has risk genes for CVD or stroke. In case of Frontotemporal dementia the patients have family history and different types of faulty genes that shows that shows close relation of this disease with the faulty genes inheritance linked mutations are mutations in tau genes, Progranulin genes and C90RF72 genes. People with Down’s syndrome have an extra copy of amyloid precursor protein increasing their chances of disease development with age progression. Huntington’s disease is autosomal dominant requiring only single faulty copy to be inherited. Gender: Women are more likely to develop dementia due to lack of oestrogen hormone after menu pause. Sedentary lifestyle: Sedentary lifestyle is another risk factor for disease. Scientists have proved that exercise improves your thinking ability and boosts memory. Diabetes People having uncontrolled diabetes are more prone to the development of disease. Unhealthy diet is another prominent risk factor. So healthy life reduces the chances of disease development. Smoking and excessive alcohol consumption can lead to disease development. Maintaining ideal weight reduces the risk for many other diseases like type 2 diabetes, CDV and hypertension thereby reducing risk of dementia. There is no proper treatment to reverse or cure the dementia but different types of medications and therapies are being used to prevent further damage, severity and alleviate symptoms. The terms dementia and Alzheimer are often confusing. People often consider that dementia and Alzheimer are two different names of the same disorder. But in fact, it’s the misconception among people as some forms of dementia are totally unrelated to the Alzheimer. Dementia is an umbrella term including the group of symptoms occurring together but is not a disease that negatively impacts memory of an individual. Dementia is caused by the damage to the brain. Whereas Alzheimer is a disease which causes damaged and death of brain cells by disconnecting nerve cells, forming plaques, clumps and losing communication between neurons. Alzheimer leads to Dementia by destroying brain cells this means that anyone with Alzheimer will ultimately develop the symptoms of dementia. But not all the dementia are due to Alzheimer. There are many other factors that contribute to Dementia like Huntington’s disease, Parkinson’s disease, Creutzfeldt-Jakob syndrome etc. But Alzheimer is the major and most common cause of Dementia accounting for 60-80% of all Dementias. The common symptoms of both Alzheimer and dementia are memory lapse, communication impairments and altered or reduce thinking power. In Alzheimer’s disease, the brain damage occurs before symptoms appear. When Alzheimer has diagnosed the cause behind brain damage is fully know that might be plaques clumping vice versa but in a case of dementia the disease is diagnosed based on symptoms without knowing the exact cause behind. The risk for both Alzheimer and dementia increases with the growing age but it doesn’t mean that it’s the part of normal aging process i.e all old age people will have either dementia or Alzheimer’s disease. 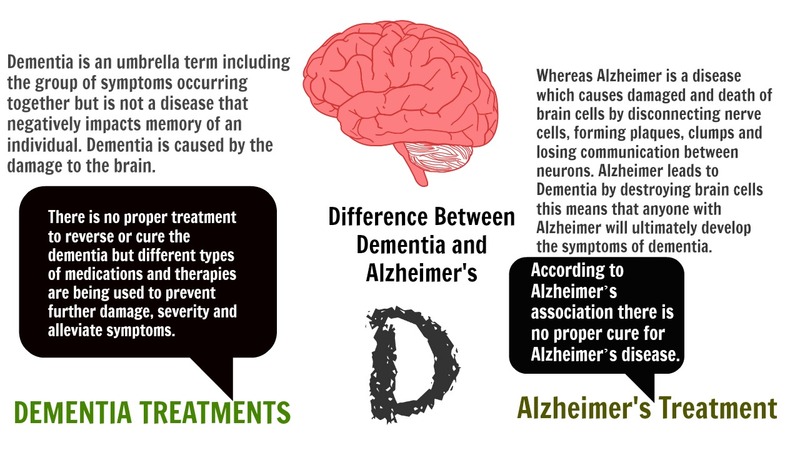 Alzheimer causes permanent damage to brain cells so is not reversible however some mild forms of dementia are curable like dementia due to mineral or vitamin deficiencies or dementia due to drug abuse. While other acute forms are not curable like that of Alzheimer. Therefore it is important to know the difference between Alzheimer and dementia to seek medical advice accordingly. Furthermore, memory boosting exercises should be done regularly to improve memory and functioning of the brain. Such tasks include puzzles, physical exercise, quitting multi-tasks at one time, using brain boosting foods or supplementary aids, brain relaxing exercises etc.